Balabanov’s last film, eerily prophetic. Bong Joon-Ho. Memories of Murder. South Korea, 2003. Vladimir Bortko. Heart of a Dog. Russia, 1988. Catherine Breillat. Barbe Bleue. France, 2009. Robert Bresson. Le Procès de Jeanne D’arc. France, 1962. Robert Bresson. Une femme douce. France, 1969. Tod Browning. Dracula. USA, 1931. Luis Buñuel. Simon of the Desert. 1965. Luis Buñuel. Simon of the Desert. Mexico, 1965. Utterly strange, though saying this of a Buñuel film is like saying oranges are orange. Apparently, financial problems were responsible for part of the story line. Brandon Cronenberg. Antiviral. Canada, 2012. I’m not going to do a whole thing comparing Cronenberg Jr. to Cronenberg Sr. Sr. is easily one of my top three favorite living directors; he’s worked in a number of different genres and has a massive corpus to work through. Antiviral, on the other hand, is Jr.’s first feature film (he’s done two shorts and has a bunch of other credits according to IMDB). It’s very much in his father’s body horror tradition—you’ll want to be wary if you’re squeamish—and I think pretty provocative. Bruno Dumont. Twentynine Palms. France/USA, 2003. Rainer Werner Fassbinder. Ali: Fear Eats the Soul. West Germany, 1974. Aleksei Fedorchenko. Silent Souls. Russia, 2010. René Feret. Le Mystère Alexina. France, 1985. The story of a young schoolteacher of mysterious gender who arrives at a new job; set in the mid-nineteenth century. Peter Greenaway. The Cook, The Thief, His Wife & Her Lover. 1989. Peter Greenaway. The Cook, The Thief, His Wife & Her Lover. UK, 1989. I am incapable of describing this film, but it needs to be seen. Werner Herzog. The Enigma of Kaspar Hauser. Germany, 1979. Werner Herzog. Into the Abyss. USA, 2011. Ellen Houde, Albert & David Mayses, Moffie Meyer. Grey Gardens. USA, 1975. Peter Jackson. Heavenly Creatures. New Zealand, 1994. Alexander Jodorowsky. Santa Sangre. 1989. Alejandro Jodorowsky. Santa Sangre. Mexico/Italy, 1989. Elem Klimov. Agony. USSR, 1981. Julia Leigh. Sleeping Beauty. Australia, 2011. 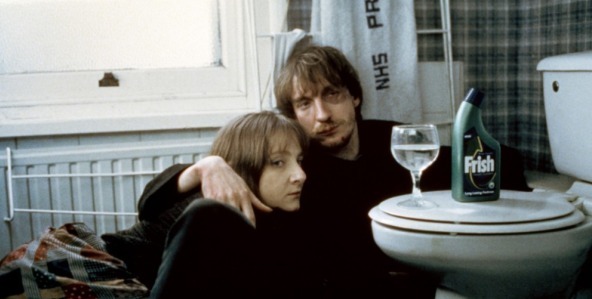 Mike Leigh. Naked. UK, 1993. Jennie Livingson. Paris is Burning. USA, 1990. Takashi Miike. Audition. Japan, 1999. Lucian Pintille. Next Stop Paradise. Romania, 1998. Jacques Rivette. Céline et Julie vont en bateau. 1974. Jacques Rivette. Céline et Julie vont en bateau. France, 1974. Jacques Rivette. La belle noiseuse. France, 1991. Tsai Ming-liang. The Wayward Cloud. 2005. Tsai Ming-liang. The Wayward Cloud. Taiwan, 2005. I’m actually not entirely sure what I thought of the film, but for the watermelon alone I must mention it here.